I have been in love with making Brussels Sprouts ever since I participated in the Creative Kitchen Challenge last summer when we were still Beyond the Green Door. They are not only tasty but I found them to be some of the most versatile vegetables around! This recipe is a quick but elegant side dish, perfect for holiday entertaining — or all year round! The teaspoon of sugar does a wonderful job of caramelizing the sprouts and shallots ever so slightly for the perfect hint of sweetness. Heat a large skilled over medium high heat. Add oil to pan, swirling to coat. Add shallots and sauté for 3 minutes or until almost tender, stirring occasionally. Add garlic and sauté for 30 seconds. Add Brussels Sprouts and sugar to the pan and sauté for 5 minutes or until brown and cooked through. Stir occasionally. Season with salt and pepper. Toss and serve. I just got a big bag of brussel sprouts, that sugar has me fascinated and I am going to make this today. Really sounds delicious. As a big Brussels sprout fan, my mouth is watering! I love Brussels sprouts and this recipe will be added to my collection. Thanks. Thanks Cynthia! Hope you enjoy them! So good, I prepare them often. Used to dislike Brussels sprouts, but would totally love these today! I love brussel sprouts too. Cooked this way they would go in the ‘comfort food” category. Yum! Also a big fan of brussel sprouts – and love anything caramelized. This dish looks wonderful! I love Brussels sprouts, and these sound really good. 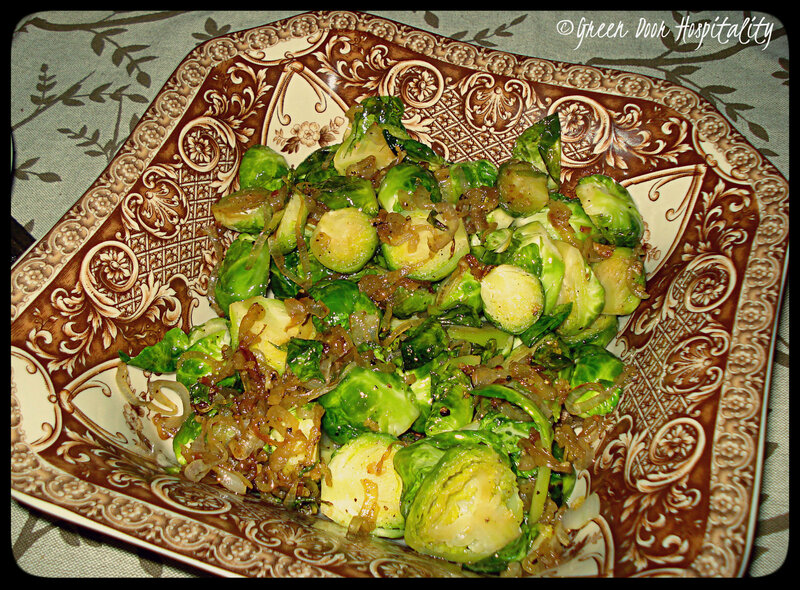 This entry was posted on November 4, 2013 by Jessica Romigh in Elegant and Affordable and tagged brussels sprouts, Cooking Light Magazine, garlic, gluten-free, Sautéed Brussels Sprouts and Shallots, shallots, vegan, vegetarian.